This Saturday, the town of Welland will be rocked by awesome bands including Bratwurst Days, The Balconies, and more for Owenpalooza! 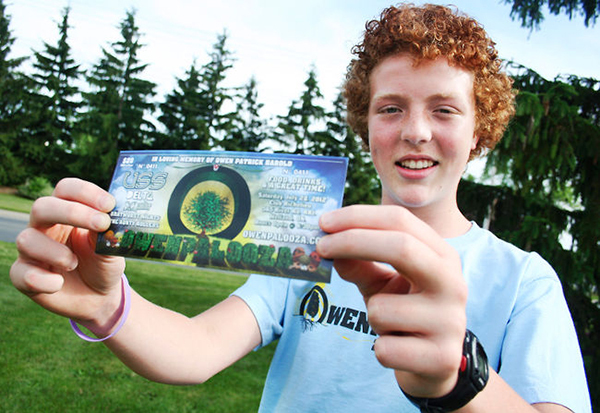 Celebrating it’s 6th year, the music festival Owenpalooza, held at Club Richelieu, is a tribute to Owen Patrick Harold, who tragically passed away in the fall of 2008 at the age of 22. Son, brother, and friend of many, Owen had a passion for music and the environment which is why the event has a “one bag” policy for garbage in an effort to keep it green. In past years, performers have included big bands such as Hollerado and USS. Owenpalooza is how family and friends remember the life of Owen Patrick Harold through the power of music, art, community, togetherness and friendship. This year’s event will also feature a local art exhibit for the first time ever. Come help celebrate the energy, passion and spirit that Owen has left with all of us. Purchase tickets in advanced for $20.00 or $25.00 at the door. Doors open at 6:00pm.